This is a scalable context timeline. It contains events related to the event May 8, 1995: Oklahoma City Bombing Co-Conspirator Says Neither He nor McVeigh Had Any Involvement in Bombing. You can narrow or broaden the context of this timeline by adjusting the zoom level. The lower the scale, the more relevant the items on average will be, while the higher the scale, the less relevant the items, on average, will be. Two men enter a hair salon, Gracie & Company, in Junction City, Kansas, for a haircut. The men will later be identified as “John Doe No. 1” and “John Doe No. 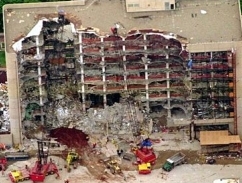 2,” suspects in the Oklahoma City bombing (see 8:35 a.m. - 9:02 a.m. April 19, 1995 and April 20, 1995). Salon owner Kathy Henderson will identify the two to the FBI, and later to the press. One man, “No. 2,” with brown hair and a square jaw, asks for a haircut for both himself and his friend. The other, “No. 1” (later identified as Timothy McVeigh, who will detonate the bomb), has light skin and a crewcut. Henderson will identify the two after seeing the sketches released by the FBI. Henderson turns the two away because, as she will recall, the salon was “all booked up.” She will recall of “No. 2”: “It was strange. He did not need a haircut. He was very well groomed.” In subsequent interviews, Junction City residents will recall seeing McVeigh in several places over the last few weeks, usually in the company of his unidentified friend (see April 15, 1995, 5:00 a.m. April 18, 1995, 8:15 a.m. and After, April 18, 1995, and 8:00 a.m. April 18, 1995). [New York Times, 4/22/1995] This witness identification clashes with the chain of events as laid out by McVeigh and the FBI (see 5:00 a.m. April 18, 1995, 8:15 a.m. and After, April 18, 1995 and Noon and After, April 18, 1995). Michael Fortier, a suspected co-conspirator in the Oklahoma City bombing (see March 24, 1988 - Late 1990, March 1993, May-September 1993, February - July 1994, October 21 or 22, 1994, December 16, 1994 and After, 8:35 a.m. - 9:02 a.m. April 19, 1995, and April 19, 1995 and After), tells a CNN interviewer that neither he nor accused bomber Timothy McVeigh had any involvement in the bombing. Of McVeigh, Fortier says: “I do not believe Tim blew up any building in Oklahoma. There’s nothing for me to look back and say: ‘Yeah, that might have been. I should have seen it back then.’ There’s nothing like that.” He continues: “People cannot make a judgment on his guilt by what they read in the paper. But by what I see on TV, they have. They want his blood. In America, we believe people are innocent until proven guilty. Everyone must remember that. Whoever says, ‘Forget the judiciary system, let’s just hang him now,’ those people are not Americans. They may think they are, but they are not Americans.” Fortier refuses to speculate on the identity of the so-called “John Doe No. 2” (see April 15, 1995, 9:00 p.m. April 17, 1995, 3:00 p.m. April 17, 1995, April 18, 1995, April 20, 1995, April 21, 1995, and April 29, 1995), instead continuing to defend McVeigh. “I just want to tell him to be strong. You are not alone. Right now, he might feel like there isn’t anyone on this earth who is any way supportive of him. But there is. Everyone should be supportive of him because he’s an innocent man.” Fortier is lying about his lack of knowledge of McVeigh’s involvement, and his own (see April 23 - May 6, 1995). [Washington Post, 8/9/1995; Serrano, 1998, pp. 243] In August 1995, Fortier will testify as to his involvement with McVeigh in the bombing plot, and will admit that McVeigh told him of his intentions to bomb the Murrah Federal Building in Oklahoma City (see August 8, 1995).